Alice has been poorly for most of this week, it started when I making us all pancakes and I had to abandon them, as she was suddenly sick everywhere. Bless her, she never got to eat the pancakes and had to watch Holly and mummy eat them…cruel mummy. I did promise that I would make them again when she is better, any excuse for more pancakes! I am lucky that Alice doesn’t really get poorly that often, in fact the last time she was really poorly, was a year ago…I have decided I don’t like February anymore! 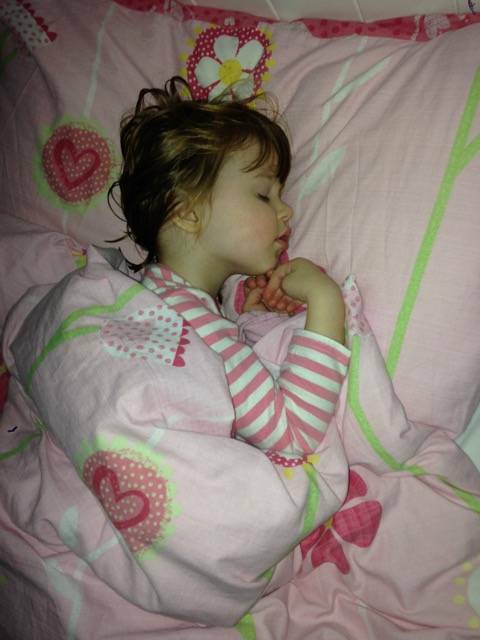 I had set myself up for a bad night and had spare sheets ready to go, but Alice had a good night…phew! Andy was going away with work, which was great timing, when sickness has struck us. We say goodbye to daddy and set ourselves up for a day at home. I am the type of person that likes to get out the house even if it’s just a trip to the shops or the cafe, it’s very rare we stay in all day. I just find that we can all get a bit of cabin fever and I find it easier being out and about with the girls. Alice was tired all morning and didn’t really move from the sofa. She fell asleep on me, while Holly was napping in her cot, and I couldn’t bring myself to move her. She just wanted her mummy and I treasure these moments…watching her chest rise and fall, stroking her hair and just being there for my little girl in case she needs me. Alice spent the afternoon curled up on my lap and Holly would bring over a toy and sit next to us playing happily. Every now and again passing Alice a toy wanting to play with her big sister and even though Alice really wasn’t up to it, she would take it from her sister and try to join in. Holly has really started to love books, I have read books to both my girls from an early age and Holly will now go and choose a book and bring it over to me, pop herself onto my lap and hand me the book. So, when this happened, Alice started saying ‘there is no room for Holly mummy’. Since the day Holly was born, I have never turned one of girls away saying there is ‘no room’. 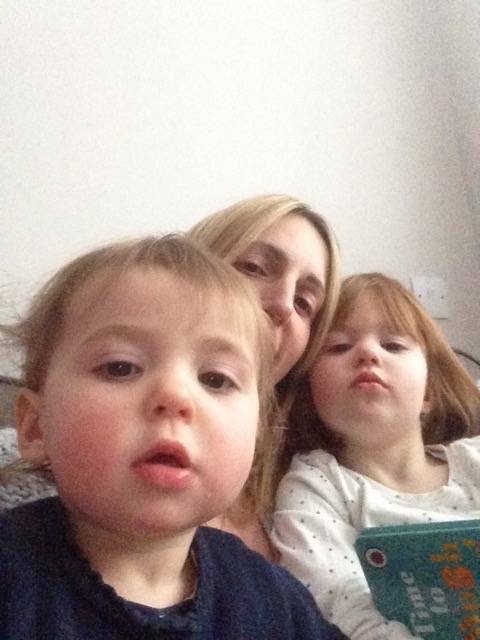 When I used to be breastfeeding Holly and Alice wanted a cuddle or to sit on my lap…I made room. I never wanted them to think I was favouring the other one, there is room for everyone…. So, this was no different, I lift Holly on and we sit and read a book and another book and another book…I could hardly move all afternoon with my girls sat on me. But, that is what it’s like being a mum, just because Alice is poorly, it doesn’t mean that Holly doesn’t need me any less. Previous Post: « Messy Play…l want to love you! It’s so horrible when they’re ill, my youngest has a horrible cough that’s keeping her (and me) awake. I do secretly enjoy the extra nighttime cuddles though. Hope she’s back fighting fit very soon. Like Katie I find it really strange when Cheeky Chap is poorly. I really hate seeing him poorly and uncomfortable but I adore the cuddles that I get. He is a very tactile child but he’s also a big bundle of energy so cuddles are usually quite brief, I secretly like the lethargy that comes when he is run down!